CROSSOVER! Everybody loves a crossover! Twelve different blogs have combined forces today to feature some of the amazing cosplayers at DragonCon 2012! Each blog in this crossover will focus on their own favorite heroes and corresponding cosplayers. If you’re not familiar with DragonCon, it’s the largest multi-media, popular culture convention focusing on science fiction and fantasy, gaming, comics, literature, art, music, and film in the universe! It’s held each year over Labor Day weekend in Atlanta. It is also known as the premier convention for cosplayers. Today here at FIRESTORM FAN we’re going to feature… well… Firestorm. Sadly there was only one Firestorm-related cosplayer this year, but what a great costume it was!!! 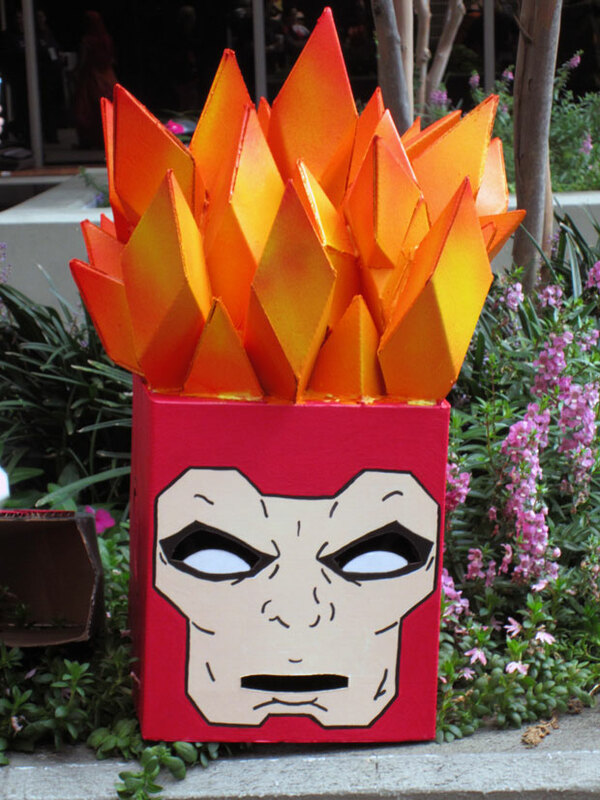 Box Hero Firestorm! All of the photos I’m displaying today were taken during cosplay photoshoots organized by the Superhero Costuming Forum. The planning and coordination of these massive photoshoots is an astonishing task! My hats off to these folks for doing such a great job! Below is a close-up of the head piece so you can study the amazing flames! 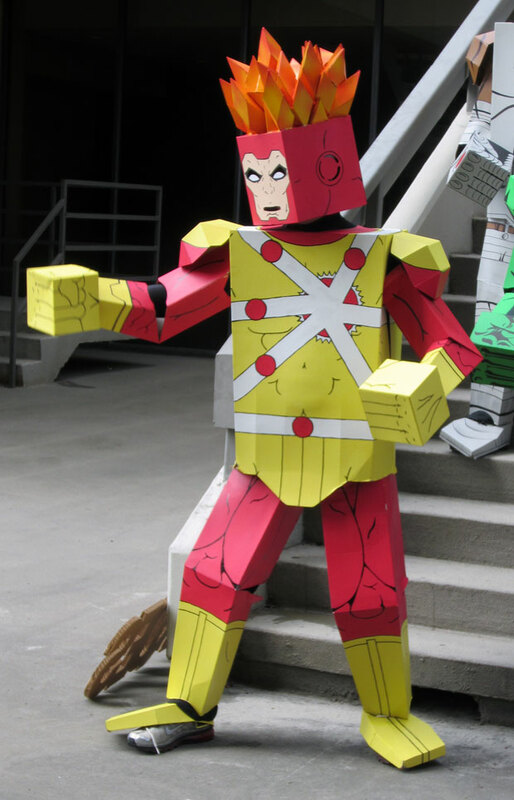 The Firestorm Box Hero was cosplayed by Allen Hansard (see below). Allen was the very first Firestorm cosplayer we featured here at FIRESTORM FAN. Additionally, Allen is the Grand Poobah over at the Superhero Costuming Forum. Finally, a great group shout of the DC Comics Box Heroes group! For more on the Box Hero Corps, visit their Facebook page or their blog. Those Box Heroes are so friggin’ cool! 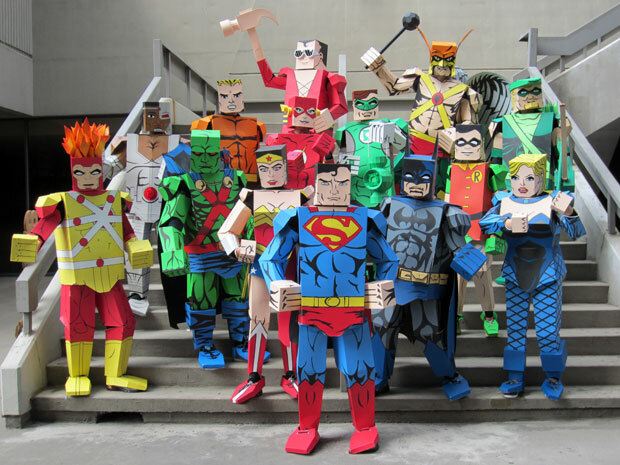 As mentioned, 12 different blogs have teamed-up today to cover some of the amazing cosplayers at DragonCon 2012! While I’m featuring Firestorm photos here on my site, you should visit these other character-specific blogs to see how they spotlight their own favorite heroes today. Visit them now, visit them later, and visit them often! If you are interested in further cosplay photos from DragonCon 2012, be sure to check the 700 photos I uploaded from DragonCon 2012! If you’ve enjoyed this blog crossover, then you should check out some previous comic blog crossovers we’ve done. The first major blog crossover celebrated the gorgeous George Pérez/Alex Ross painting from the Crisis on Infinite Earths 1998 hardcover. The next major blog crossover was a celebration of the Super Powers Collection’s 25th Anniversary. Some subsequent major crossovers included: DC Challenge, Read This Too, Mayfairstivus, April Fool’s Day 2011, Blackest Night to Brightest Day, Green Lantern: Circle of Fire, Animated Anthem Day and Secret Files & Origins! Support Firestorm (and these other bloggers)! Fan the flame! Posted in: Cosplay, Crossover, Firestorm #01: Original (Ronnie/Martin), Justice League of America.